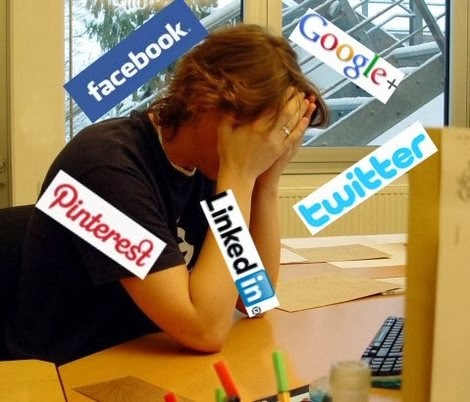 Deb's Web: Can a Blogger Give Up Social Media and Survive? Can a Blogger Give Up Social Media and Survive? Is great content without promotion enough to keep a blog going? I may find out, because I'm just about done with social media. I spend so much time on social media, that I don't blog as much as I should. I don't even WORK as much as I should. I have no life outside this house. My online friends are becoming my ONLY friends, and that is just sad. I'm starting a social media vacation tomorrow, Feb. 26, 2014. I'm moving May 3, so I won't be posting until after that. I did this before for 30 days and failed miserably, but this time it's different. This time I have tons of other stuff that needs to be done -- like writing and packing and such. I just don't have time to socialize. Once I get there, I will be involved in the community gardening and sustainability communities, and maybe Occupy. I think my socializing IRL will trump my socializing online. Of course, I won't forget my online friends entirely. The important ones have my email address, and can stay in touch that way. The most important ones have my phone number. I don't worry about losing blog readers. I'll just start writing more frequent and more searchable posts. From what I have seen of my stats, most of my traffic comes from Google anyway, so I won't be losing much. If I get to write more often, I'll get more traffic by default, right? So if you like the blogs, but only read when I post on Twitter or G+, this would be the time to subscribe through RSS or email.